Introducing the Wolds 1st complete solar Solar Radiant Floor Heating System! This Hybrid solar radiant heating system is a complete solar heating kit that works with any in floor heating loop or radiant floor system. The system is designed to be used as the primary heating source for any radiant floor system, replacing the need for an expensive boiler. It is completely scalable from 300 ft 2 up to 2000 ft 2. 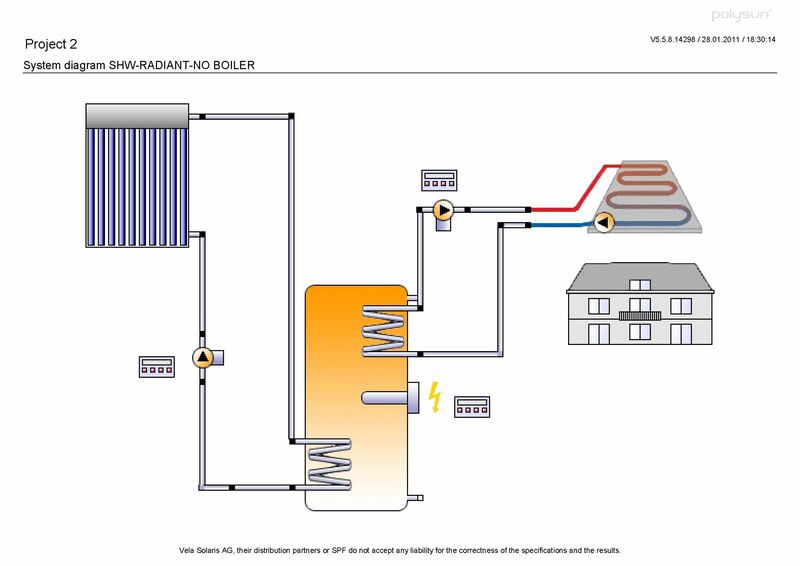 The hybrid solar radiatn heating ystem includes a primary solar heating loop with both a top and bottom heat exchanger and 4.5 Kw heating element in a 120 gallon solar storage tank. The hydronic loop is feed through the top heat exchanger using a second pumping station that is included with the package. The middle electric element turns on only when the demand exceeds the stored solar energy supply. The RESol BS/+ advanced controller seamlessly controls both the solar loop and the hydronic loop ensuring maximum performance. The solar panels collect the suns energy and heat the special solar heating fluid (good to -40 F). This hot fluid is then piped through a large 1 1/2" internal heat exchanger found in the bottom of the solar storage tank. The heat energy is then transfered to the water storage medium and the hot water rise to the top of the tank. The top of the tank contains as second heat exchanger that connects to a second pump/fill station on the radiant floor loop. A middle 4.5 Kw heating element is set to turn on only when the top of the tank's temperature is below the minimum required temperature. This ensures the top heat exchanger always has the correct amount of energy available for the radiant floor loop. The RESol controller controls both the solar loop pump and the radiant floor loop pump which is set to the desired room temperature. Note: For the Solar Radiant Floor Heating Loop- piping and manifold is not included. Sizing depends on the square footage of the building and the location and construction the of the building. Good southern exposure is the 1st requirement for any solar readiant solar raidant floor heating application. As a general rule of thumb, Northern US and Canada will require one collector per 300 square feet of floor heating area, Mid US States will require 1 x TZ58 1800 30R collector per 400 square feet of floor area. Our Solar Radiant Floor Heating systems are recommend for up to 2000 square feet with 5 panels. If you have more heating area, then we recommend you purchase additional system. A 4000 square foot home in Colorado will generally need 2 systems with 4 collectors each.